To measure your foot length, place a sheet of paper on the floor against the wall. Place your bare foot on the paper with the heel against the wall. Mark your longest toe on the paper and then measure the length from the wall to this mark. If intending to wear socks or stockings with footwear please ensure you measure the foot length wearing these. Remember to do this with both feet. 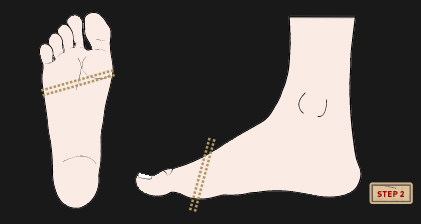 Using a household tape - measure the widest part of each foot. Tape measure should be placed behind the little toe and over the joint of the big toe. 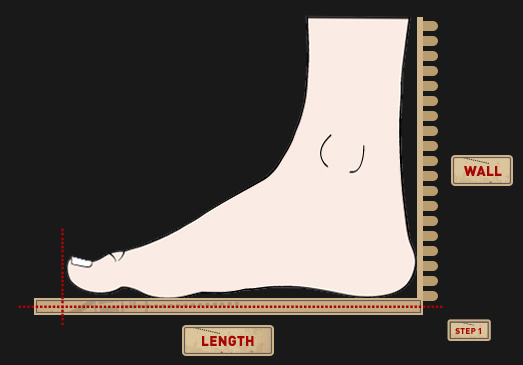 You only need to measure the girth of your foot if your foot is wider than the normal size. Please click a link below to view the Global Size Conversion Chart.